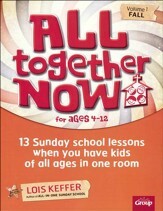 The All-Together Now series is an undated curriculum set of 4 volumes for ministries with children aged 4 to 12 (Kindergarten to 6th Grade). Each volume has 13 lessons and the series totals 52 lessons, for a full year's worth of teaching material. It's a great resource for smaller churches, midweek services, or anytime you have children of different ages together in church. 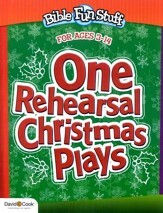 Each lesson includes an attention grabber that introduces the theme, Bible exploration (for example, an interactive Q & A or a participatory skit involving kids in the room), life application (craft), commitment (links craft to lesson theme) and closing prayer. Volume 2 is intended for use in the winter quarter. Written by the author of All-In-One-Sunday-School. 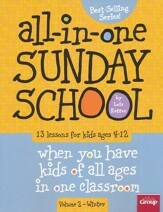 All Together Now Sunday School is a best-selling Sunday school series by Lois Keffer. Youll find All Together Now Sunday school lessons available in four volumesone for each season of the year starting with fall. Through these kids Sunday school lessons, your childrens ministry will experience life-changing adventures for kids in kindergarten through 6th grade. Imagine the impact these 13 interactive Sunday school lessons will have on the children of your church. Through All Together Now Sunday School, youll discover interactive Sunday school lessons filled with creative ideas for mixed-age classes ages 4 to 12. All Together Now Sunday school lessons work great for small churches, larger churches with multi-age classes, midweek programming, and anytime you want to teach meaningful Bible lessons to children of different ages in the same class. With these kids bible lessons you will be ready no matter who shows up. Think your kids have heard all the stories about Jesus... his birth, his early ministry of healing and teaching, and his dynamic miracles? Think again! Walk with Jesus like never before with these 13 brilliant bible lessons in All Together Now Volume 2: Winter. 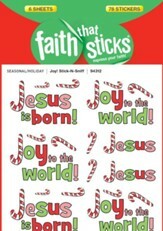 Group Children's Ministry Resources make Jesus real to kids. We create practical, authentic ministry resources that equip ministry leaders and volunteers to do what you do bestlead kids to Jesus. Our goal is to let God shine through you as you help kids to love God and love others. Everything we do revolves around your real, everyday ministry. We create experiences that help people grow in relationship with Jesus and each other. I'm the author/artist and I want to review All Together Now, Volume 2.